Some would say that Reginae Carter and YFN Lucci were destined for failure when they started dating. A few months ago, Reginae was speaking to her mother on their reality show and she was seriously critical of the age gap between Lucci and Nae. They appeared to be in love but as of late, they stopped showing up on each other’s social media pages. Since the couple shared many of the moments they spent together, it was a troubling sign. They appeared to confirm rumors of their break-up this week with subliminal shots on Twitter and Instagram. While they started off acting somewhat petty and airing out their drama for everyone to see, Big Lucc appears to be in his feelings over the split now. The rapper updated his Instagram story with a text post to tell everybody how he’s really feeling. 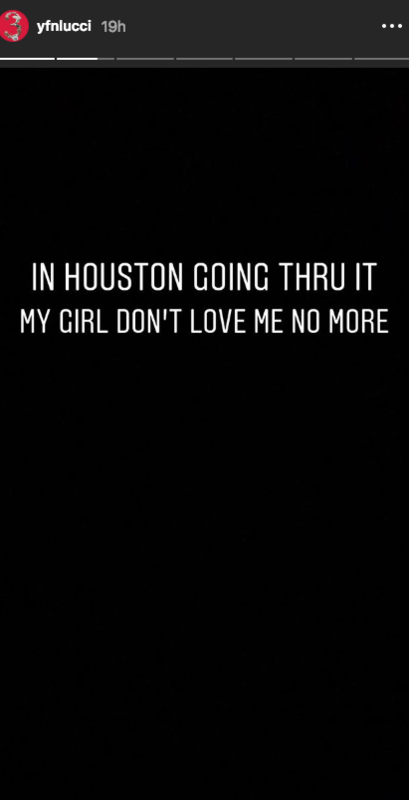 “In Houston going thru it,” wrote the artist. “My girl don’t love me no more.” Reginae and Lucci were one of hip-hop’s hottest couples in 2018 but it seems as though all good things must come to an end. It’s unclear what caused their breakup but Lucci sounds like he would be open to getting back together. Hopefully, Lucci got himself a few Lil Wayne verses while he was part of the family. It’ll probably be pretty difficult from now on out to secure some Weezy vocals.